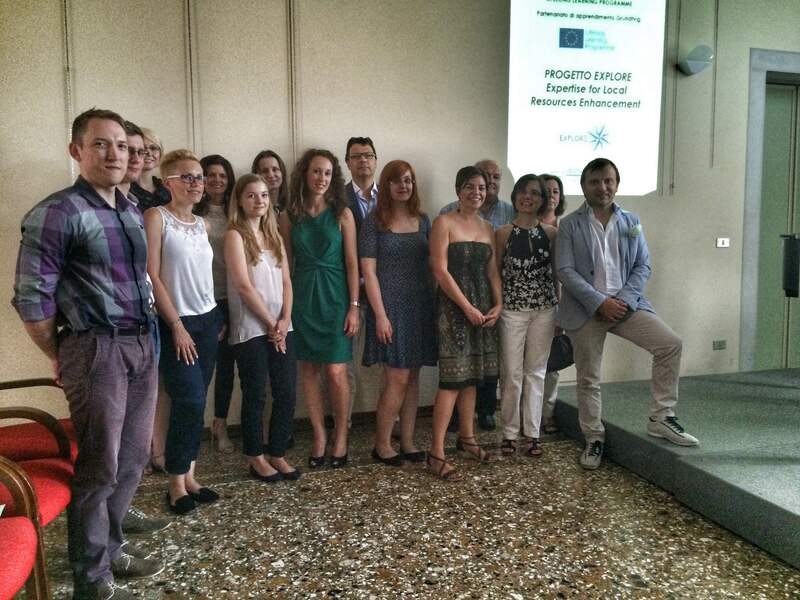 The EXPLORE project, started on July 2013, has been developed during a two years path concluded with the final event held in Oderzo/TV on the 9th and 10th July 2015 at Oderzo City Hall premises. During the two days meeting, Sviluppo Progetti Scarl, the Project coordinator, organized several activities such as a press conference, at the presence of all partners, local public stakeholders and the press, and partners project management sessions dealing with the Final Report preparation and with Project Guidelines Manual adjustment. Below you will find more detailed information on the meeting development. EXCHANGE PARTNERS BEST PRACTICES, to identify effective strategies for the local development to be realized in project involved areas. PROPOSE A SET OF GUIDELINES AND RECOMMENDATIONS in order to promote local development, to create employment, to support self-entrepreneurship opportunities in times of economic of crisis, through a community-led local development approach. DISCUSS THE PROPOSED GUIDELINES WITH LOCAL STAKEHOLDERS involved in the project development, verifying the proposal efficiency through a comparison with concrete case studies identified in partners local areas. PROMOTE PROJECT PARTNERS FUTURE COOPERATION, involving local stakeholders participating in project activities as well. In the morning of the first meeting day, Sviluppo Progetti Scarl organized a press conference held at Oderzo City Hall. The Press conference purpose was to present the EXPLORE project conclusions at the presence of all partners, local public stakeholders and press representatives. The Press conference was opened by Sviluppo Progetti Scarl, the project Coordinator, that introduced both project partners and local stakeholders representatives invited to take part to the press conference as speakers. The Coordinator gave the floor to the first speaker: Ms. Meri Zorz, Councillor for Culture, Education, Tourism and Volunteering of Oderzo Municipality. Ms Zorz welcomed the participants in Oderzo and presented the program of local events aiming at local area promotion and traditional products valorisation. The events organization would be managed within the Opitergino Mottense Territorial Planning Alliance (e.g. IPA) headed by Oderzo Municipality and including several bordering local municipalities. The co-ordinator then presented the EXPLORE project conclusions, starting from the project general aim, describing partners expertise and background and briefly going through the methodological steps and decisions that guided the project final guidelines drafting during the whole project development. The coordinator focused the attention on local stakeholders involvement in the project development. With the aim to increase the effectiveness and viability of the recommendations that partners identified on three main themes discussed during the whole project (e.g. Employment Promotion, Effective use of the EU funds and Networking promotion and good practices exchange among stakeholders), each partner submitted a questionnaire to local stakeholders that have been selected because of their expertise on the above mentioned three themes. Some of Sviluppo Progetti Scarl selected local stakeholders took part to the conference. Following the project conclusions presentation, the Coordinator gave the floor to the second speaker: Ms Michaela Crespan, Representative of EU Policies and Smart Cities Department of the Treviso Municipality. Ms Crespan focused her speech on the positive results coming from frequent and in-depth training activities in favour of the local public administration staff in charge of activities coordination within the EU policies and funding programs implementation at local level. Treviso Municipality, in spite of the very recent creation of the EU Policies and Smart Cities Department public office, has already been involved as partner in the EU funded projects in the energy, social and environment fields. The following speech was held by Mr Michele Genovese, Representative of the LAG – Local Action Group dell’Alta Marca Trevigiana, who shared with the audience the projects realized by the LAG dell’Alta Marca Trevigiana in the 2009-2014 period, some of them through the EU funds. Finally Mr Riccardo Nardini presented the “ViviVeneto.eu” web portal developed within a project financed by the Veneto Region funds in the framework of the Youth Guarantee Programme. This web portal aims at Veneto Region promotion through internet spreading valuable information in the tourism, events, food & wine and fashion fields, which are strengths characterizing the Veneto Region area. Mr Nardini took parting the press conference also in its role as a Journalist at “La Discussione” online national newspaper. The contents discussed during the press conference were particularly appreciated by partners who proposed themselves as partners in future projects concerning territorial valorisation. In the afternoon session, partners focused on the preparation of the Final Report to be submitted to the National Agencies by the 30th September 2015. The project coordinator gave a quite detailed presentation about applicable common rules, described the structure of the final report presented different examples of similar reports, introduced the aims and functioning of the EST–European Shared Treasure database. After this presentation and a short discussion to clarify some aspects of the final report preparation, specific tasks and deadlines were assigned, so that each partner can contribute to the preparation of the common part of the report. any adjustment, changes, etc. proposed by partners. Partners jointly identified the manual sections that should be organized (e.g conclusions section), completed (e.g. answers to the questionnaire) or revised (e.g. SWOT analysis) and established how to manage the activities, which is the partner in charge of each task implementation and the deadline to fulfil them. 3rd section: the project key recommendations on the three main themes discussed by partners within the project. The 4th section would deal with Annexes and contain all tables such as each partner SWOT analyses, Case study, the answers to the questionnaires submitted to local stakeholders and references. Within the first three sections and the fourth links would be provided to allow a better comprehension and a better usability of the whole document by several target groups. The meeting ended with the distribution of the certificates of attendance at the meeting to all partners.